When I was asked to review Zim's Max-Freeze I thought sure - why not. I am always looking for a pain relieving product for my hands. The fact that Max-Freeze is formulated with naturally-based ingredients was a huge plus. Max-Freeze sprays on clear with a refreshing soothing scent. What is nice is the product absorbs into your skin quickly and the scent disappears. I really like the fact that the scent vanishes leaving no scent at all. Smelling like pain reliever always clashes with my Tresor! My hands are especially sore by my wrist and all around my thumb. I have to say the Max-Freeze makes a huge improvement. I am surprised at how the Max-Freeze was able to eliminate much of the pain. I wondered if the Max-Freeze would continue to work if I used it for a while. It does! I have been using Max-Freeze for about a month and I am happy to say that when I used it before typing this post - it was able to make typing much more pleasant. In fact my can is empty - so time for me to head to the store to buy more. I like the fact that Max-Freeze is available at my local Walgreen's. I wanted to share Max-Freeze's ingredients with you. Check it out - all natural and some are organic. Inactive Ingredients: *Aloe Barbadensis Leaf Extract, *Arnica Montana Extract, Camphor, Carbomer, Ethylhexylglycerin, *Ilex Paraguariensis Leaf Extract, Isopropyl Alcohol, Phenoxyethanol, Tea Tree Oil, Tocopheryl Acetate (Vitamin E Acetate), Water. * Indicates certified organic. You know how I told you I was worried I would not be able to make some special glass gifts. Well that is not the case thanks to Max-Freeze. Here are two bracelets that I am giving to my sister-in-law as this post goes live. We are meeting her and Dave at a casino in northern Wisconsin for a two day getaway. Darla is a Blue Moon Beer drinker and a huge Packer fan. 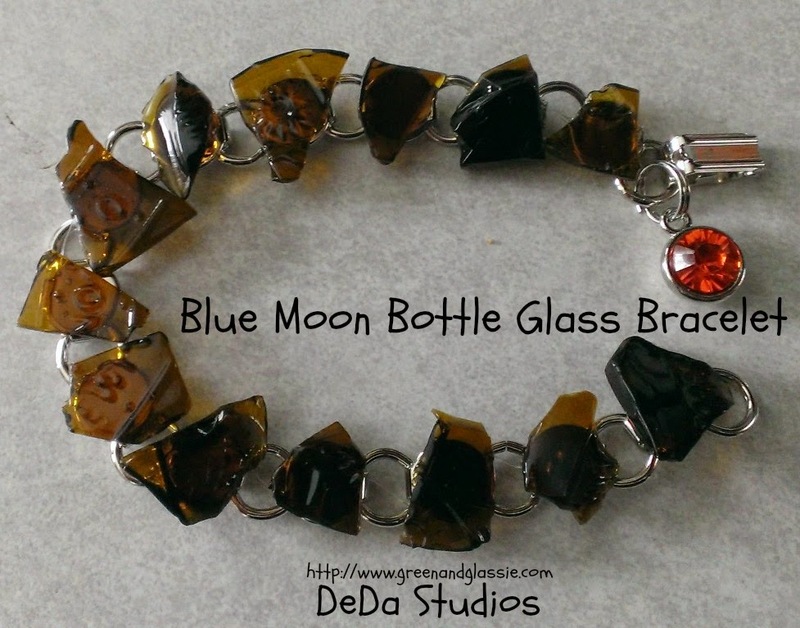 I made her a bracelet from a Blue Moon bottle and added a orange. Plus, a cut glass Packer bracelet with a bee. They are the owners of D's B's Honey. 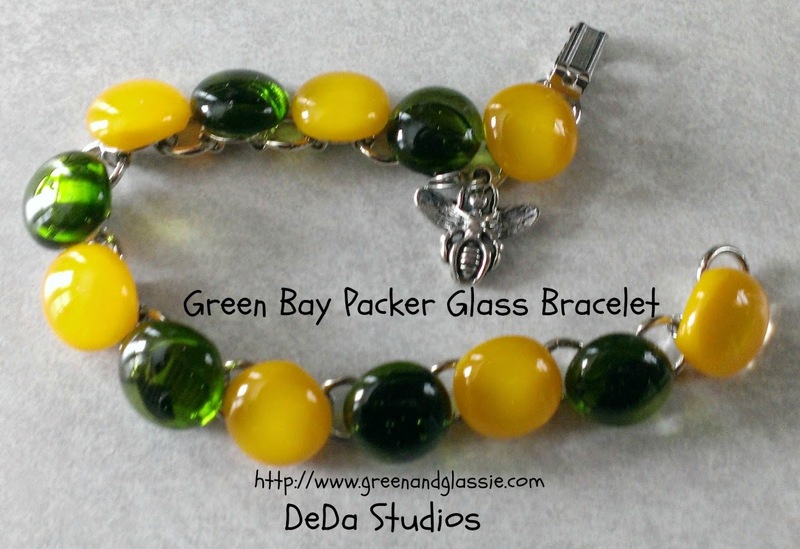 Me making a Packer bracelet is something that I am not that fond of considering I am a huge BEAR fan! Since I reviewed Max-Freeze I have also tried the Max-Freeze Gel - I like it too! MaxFreeze sounds great. I love all natural products whenever I can get them. I prefer natural products when I can get them, too! My husband has a bad knee, so I might pick some of this up for him! B: It's a spray. I'm a terrible pill taker. They always get stuck in my throat. I have arthritus in my hands and knees and some days it is just to painful to do much. Going to be checking this out. This sounds like great stuff. I don't have arthritis, but I do have aches and pains, and this would probably work for those, too. I prefer natural products when they're effective. It sounds like Max Freeze works perfectly! I am sure arthritis is closer to my daily life than I want to imagine. Thanks for the tip on the products. I have thought over the years that I had arthritis because my joints ache when the weather turns nasty. Glad there is a product that helps! I need to tell my m-i-l about Max Freeze. She suffers from terrible arthritis pain in her hands. Thanks for the recommendation! I've got a pretty good case of arthritis in my right hand, and this might be helpful for me. Thank you for this review. I too have horrible arthritis and struggle daily to do what needs to be done. I am going to have to try this. Max Freeze sounds like such a useful product! Thankfully, I've never experienced arthritic pain - sounds horrible! That is one way to use it! Sounds like a good thing to have if you are suffering. I had no idea something like that could make a difference. That's awesome! My daughter has arthritis in her shoulder and knees from repetitive injuries. I need to get this and see if it helps her! I have arthritis in my toes, and if this works for you, I'm going out and getting some today. This sounds great! Id never heard of Max Freeze before sounds neat! I will have to share with my Hubby's aunt! I have tried Max Freeze before and it did work great! I loved it because it cooled off my knee! Thank you for sharing. My Mom has severe arthritis and i'll be sharing this info with her. I need to check this out for my husband. He is getting arthritis in his hands. Max-Freeze sounds wonderful. I love that it also has natural ingredients. Great ideas. We love using Max-Freeze on hubby's shoulder as he has major pains. Thanks for sharing. I need some of this. Nice share. I will have to look into this. I have it bad in my hands. I love those bracelets. I have a product that was made just for me from my physical therapist but hubby would surely benefit from this. I have arthritis and use Zims too! It works great! You make such nice jewelry! I'm glad you found something that is working for you. It's no fun to be in pain while you are trying to do regular things throughout the day and what you love. It is important to find ways to manage pain so that we can do the things we enjoy in life. I am glad that this is a product that is helpful for people with arthritis. It is so important to be pain free. That Blue Moon bottle bracelet is AWESOME and right up my alley. That sounds fantastic for those achy joints/ LOVE the bracelets! Wow, I am so glad that this helped you with your arthritis! Your bracelets came out beautifully! I know a ton of people, including me, my husband and my mom, who would be really interested in this. Thanks for the lowdown! I'm so sorry for you having such bad arthritis. I admire how you don't let it get you down from the things you want to do! Wow, glad you were able to get some relief! The bracelets are beautiful! I'll have to let my MIL know about this. She suffers pretty badly most days. My arthritis is getting worse. I have tried so many things without much luck. I'll have to look at this product. Those bracelets are beautiful! I will tell my mom about this! She has a lot of arthritis in her hands and arms! Oh this is really interesting! Can't get this in my country yet but fingers crossed! What a great product for those that have arthritis. I'll have to look for this product in my area. I have some good friends who live with arthritis, and this could be great for them. Thanks for spreading the word. I'm glad you found someting to provide you relief. I hate you had to be in pain as long as you were though. Such beautiful bracelets. Glad you found relief for your arthritis. My Mom swears by Max-Freeze. She uses it all the time! Max Freeze sounds wonderful. I'd love to get this for my husband's grandmother who suffers from arthritis and lives in South Africa. I try to buy natural products whenever I can. I don't have arthritis, but my fingers often get sore from typing on the computer all day! Always great when you find a pain relief that works as promised! (actually anything that works as promised is rare these days!) I love Gaming also, it's been way too long since my last Casino visit, so I'm thinking I'll be super lucky the next time I go! I love an all natural product. I will have to pass this along to my mother who could use it! Sorry to hear about your arthritis! It's beautiful how you make handblown glass gift for friends!! Those are some beautiful glass products. The beer dish I purchased from you years ago is still a loved gift. I have some family members who have this problem, guess it runs in the family as we all get older. One has it in their toes and has had botox, I think, to try to help. Will share this with them!